Would you like a cake for RM1? So an hour till your lunch break? Well I’m sure am hungry so to make life all fair I’m gonna try and make you hungry too! Or just a classic bowl of good traditional spag. I don’t know about you but I’m pretty pumped for lunch. Anyways, I’m quite sure you(esp ladies) would have the same dilemma. I love desserts after a good meal, but often, we are quite concern about the budget we have for that particular lunch. Desserts, esp cakes after a good meal just makes up the perfect combination for a good lunch but usually a price we are quite reluctant to spend for just a lunch. Sui Ying: OMG YOU HAVE CAKE.. CAN WE SHARE?? Sui Ying: like pretty pretty please? Well fret not now, for the next 2 weeks Secret Recipe is having an amazing deal! 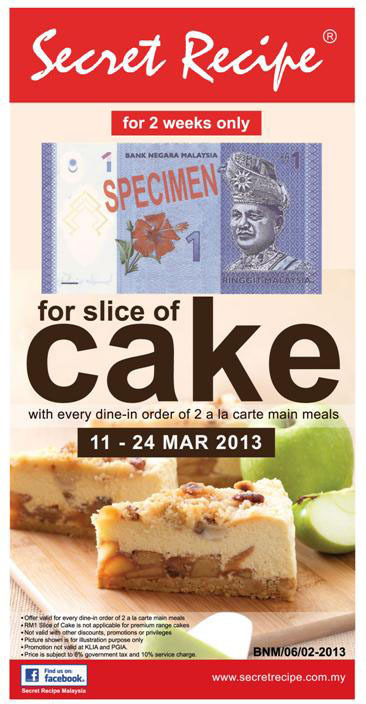 For every 2 main meal purchased from their a la carte menu(for dine in only) you get to have a cake for RM1!! How awesome right! So I bet the main headache now would be to deciding on which exact cake you’d wanna have for lunch now. or something a little more exotic like ze tiramisu? or maybe, just maybe if you aren’t having any meetings after your lunch you could possibly consider the ever so sinful Durian Durian? Meeting too important? ok, fine what about the extreme choc indulgent? yup, I sure know what I’m picking for dessert now. So yeah, behold, the all mighty solution for a bad day. So yes, if you didn’t read anything above, here’s pretty much a summary for it. Order 2 main meals and get a cake for the price of RM1! so if I were you I’d start finding the people around me to go to Secret Recipe for lunch..hmm maybe I should blackmail them into it.. Desperate measures for desperate times right? So to end the post, here’s my OOTD for our food review the other day.